Information on Roth IRAs often refers to the “five-year rule,” but in fact there are two separate five-year holding requirements that may affect the tax treatment of Roth distributions. The first determines whether a withdrawal of earnings will be tax-free, and the second determines whether a withdrawal of converted principal will be penalty-free. You can withdraw contributions to a Roth IRA at any time without tax liabilities or penalties, because contributions are made with after-tax dollars. However, to qualify for a tax-free and penalty-free withdrawal of earnings, the distribution must take place after age 59½ (with exceptions for death, disability, and up to $10,000 for a first-time home purchase) and meet the Roth earnings five-year rule. The five-year holding period for earnings begins on January 1 of the tax year for which you made your first contribution (regular or rollover) to any Roth IRA you own. For example, if your first Roth IRA contribution was designated for tax year 2016 (even if made in early 2017), your five-year holding period began on January 1, 2016, and will end on December 31, 2020. You have only one five-year holding period for determining whether distributions from any Roth IRA you own are qualified tax-free distributions. Inherited Roth IRAs are subject to different rules. When you convert assets in a traditional IRA to a Roth IRA, the amount you convert (except for any after-tax contributions you’ve made) is subject to income tax in the year of the conversion. If you withdraw any portion of the converted amount within five years, you may have to pay the 10% early-distribution penalty on those funds, unless you’ve reached age 59½ or qualify for an exemption. 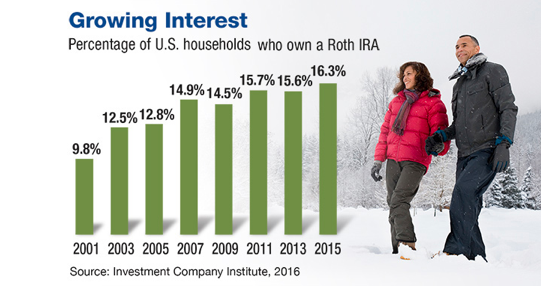 This five-year holding period starts on January1 of the year you convert assets to a Roth IRA. If you have more than one conversion, each will have its own separate five-year holding period for this purpose. This rule also applies to assets rolled over from a qualified (tax deferred) retirement plan such as a traditional 401(k) to a Roth IRA. These guidelines may be helpful, but Roth distribution rules are complex. Be sure to consult your tax professional before taking any specific action that might have tax consequences. This information is not intended as tax or legal advice, and it may not be relied on for the purpose of avoiding any federal tax penalties. You are encouraged to seek tax or legal advice from an independent professional advisor. The content is derived from sources believed to be accurate. Neither the information presented nor any opinion expressed constitutes a solicitation for the purchase or sale of any security. This material was written and prepared by Broadridge Advisor Solutions. © 2017 Broadridge Investor Communication Solutions, Inc.